Sita from the Ramayan is a character that many modern Indian women have problems relating to. Obedient and dutiful, the silent suffering Sita has been moulded in a male's idea of the ideal Indian woman. Unlike the vengeance seeking Draupadi, she comes across as meek, not questioning her husband on why she needed an agni pariksha, and then, quietly retreating into the forest when rejected by him. In recent times, there has been an attempt to define Sita differently. Amish showed her as a warrior princess some books ago. Chitra Banerjee Divakaruni, however, has attempted to enter into Sita's mind, and tell the story of the Ramayan through her. Though, of course, this is the Sitayan. 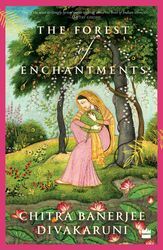 One cannot do a review of the Forest of Enchantments without the obvious comparison with her earlier Palace of Illusions, the story of Draupadi. The Palace has an easy flow that is natural in first attempts. In the Forest, Divakaruni is constantly trying to up the scale of the previous book. Draupadi's story had a lot of interesting chemistry—between her and Kunti, Bheem and Karna. In Sitayan, the author keeps the chemistry toned down, but gives many more insights from female eyes that tomes like Valmiki's Ramayan and Tulsidas's Ramcharitmanas ignored. Many other authors have written from the perspectives of these characters before; Maithili Sharan Gupt’s Saket, for instance, has Lakshmana's wife Urmila as the central character. So Divakaruni’s approach is not exactly new. Yet, this entire book is as much about female empathy for another female as it is about a woman's wonderment about the way men think. The magic of the book, however, is that it makes the readers want to read on, even though the story is one they have known from their own childhoods. Will she, or won't she, forgive Ram in the end? Divakaruni certainly knows how to make an ancient tale seem new.